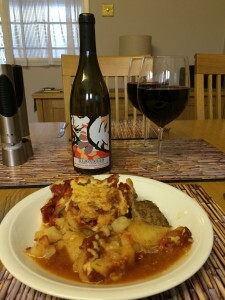 For a midweek meal we tried Gratin de Pomme de Terre et Viande from Supercook. This is potato and beef patties baked with a tomato sauce. The minced beef combines with potato, garlic, onions, melted cheddar cheese and a sauce made from canned tomatoes, tomato purée, thyme and seasoning. Very tasty. 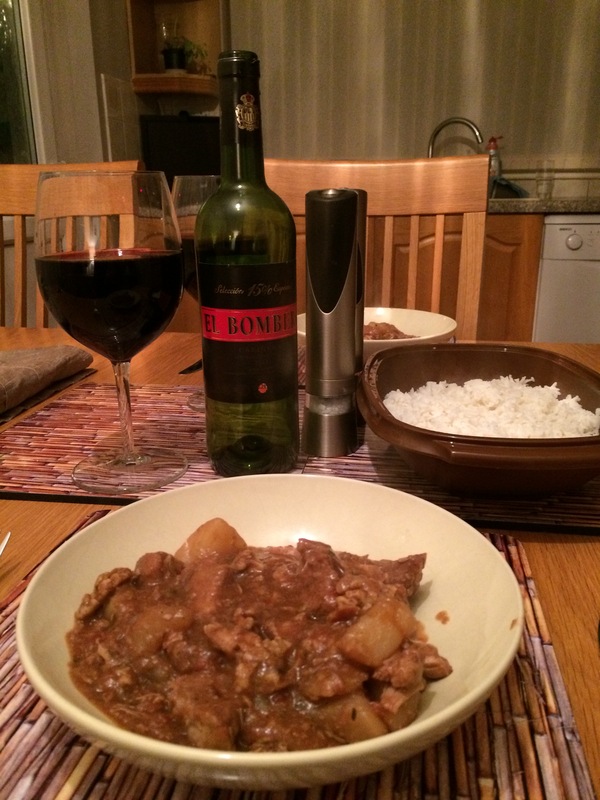 We paired the dish with a bottle of Bajondillo Méntrida 2012, a full-bodied Spanish red from the Wine Society. This creamy, smooth, rich Garnacha comes from the province of Toledo just south of Madrid and we savoured its black fruits, especially blackberries and cherries and a dark chocolate edge. Highly recommended and great with the food. 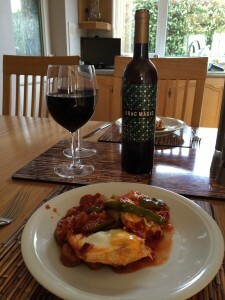 We tried a Spanish recipe from Supercook – Huevos a la Flamenca, which is eggs baked with chorizo, onions and pepper. The eggs are baked in the oven with sliced chorizo sausage, onions, garlic, canned tomatoes, sliced green pepper, pimiento and oregano. 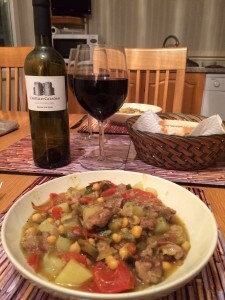 For us this taste of Spain demanded a Spanish wine and we opened a bottle of Drac Magic Tempranillo-Garnaxta-Syrah, Catalunya 2011, a full-bodied Spanish red from the Wine Society. We tasted red fruits, especially strawberries, black cherries, spiciness and a dark chocolate and vanilla sweetness. The finish was smooth and rounded. This lovely wine was a perfect match with the food. We tried a different version of Chilli Con Carne from the Slow Cook Book. 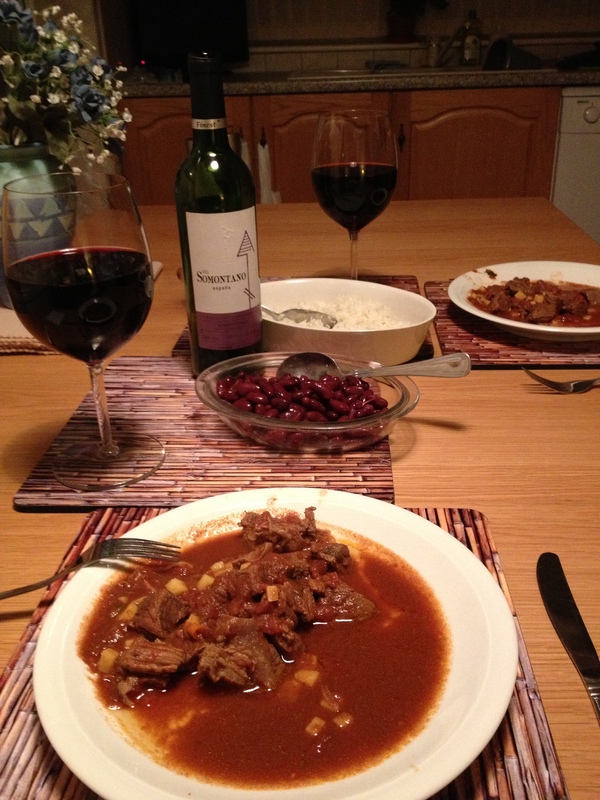 It is Texan style – chunks of braising steak are used instead of mince and the chilli beans are served as a side. We opened a bottle of Somontano 2011 from Tesco’s Finest range. This medium-bodied Spanish red is a blend of Garnacha, Syrah and Graciano. We were very disappointed with this wine and it tasted horrible with the meal. 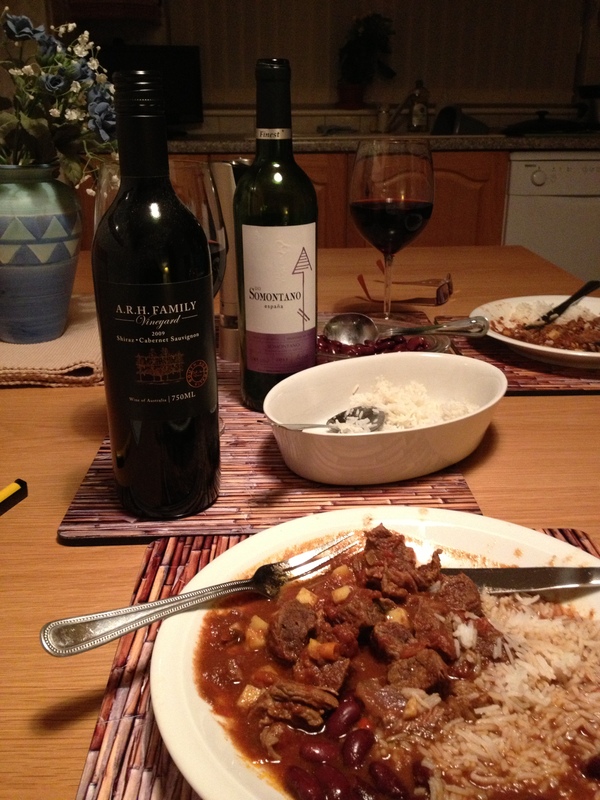 We set it aside for us e in cooking and opened a bottle of ARH Shiraz/Cabernet Sauvignon 2009, a full bodied red from the Sunday Times Wine Club. We enjoyed the wine’s flavours of red fruits and vanilla, with a chocolatey sweetness on the finish. A much better match with the Chilli. 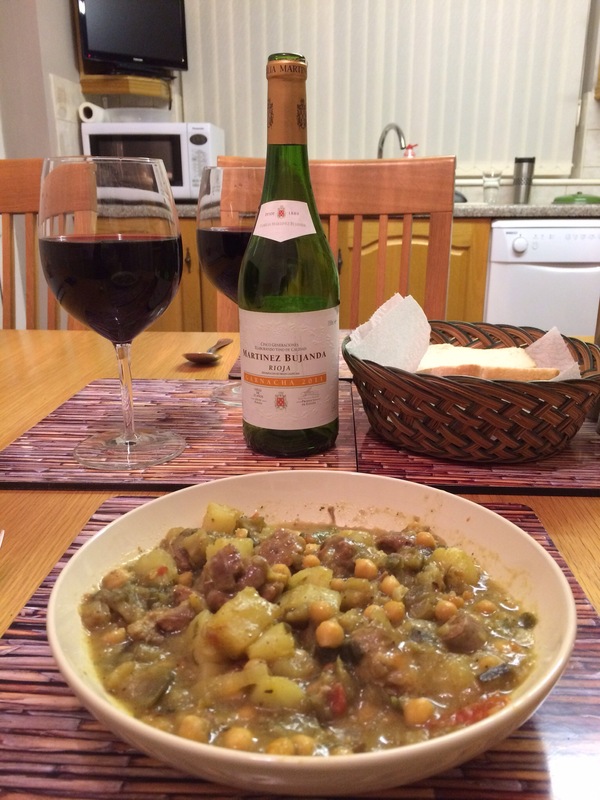 We tried Malai Gosht (Lamb with Cream) from Madhur Jaffrey. This is a richer version of Bhuna Gosht and it contains lots of cardamon pods. We served the curry with naan bread. We paired the meal with a bottle of Familia Munoz 2008, Vino de la Tierra Castilla. This full bodied Spanish red from the Sunday Times Wine Club is a blend of Tempranillo and Garnacha. We enjoyed its black fruits, especially cherries with an oaky, vanilla, spicy edge and a warming finish. A good match. We have been watching Nigella Lawson’s Italian cookery series Nigellissima. It hasn’t exactly received rave reviews and sales of the accompanying book have not been encouraging either. There has been criticism that some of the recipes are not particularly healthy. We fancied trying “Meatzza” Apparently, this dish is aimed at children and is supposed to be a cross between meatballs and pizza. We must be big kids then. Quite a few food critics slagged the recipe off in an arrogant, snooty manner, which made me even more determined to try it. Yes it was dripping in fat. Sitting in it, in fact. Following the instructions went right against Teresa’s usual practice of draining off the fat after frying minced beef, so the result reminded us of a fatty beefburger. We added extra parmesan and garlic and the end result was actually quite tasty. However, I wouldn’t recommend this as part of a “calorie-controlled” diet, or as a weapon in the fight against childhood obesity. We intially paired it with a Kulapelli Cabernet Sauvignon/Carménère, one of Tesco’s Finest range, but it didn’t work, so we turned to a bottle of Campo Viejo Rioja Reserva 2007, a full-bodied Spanish red from Costco. We detected berries and vanilla on the nose and tasted red berries and smooth vanilla, with a spicy finish. A good match. 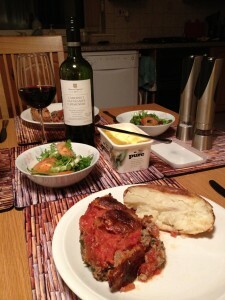 We cooked an interesting Supercook dish called Zorba’s Meatballs. These are a subtle blend of lamb, beef, garlic and spices with a creamy Mozzarella cheese filling served with a tomato and mint sauce. 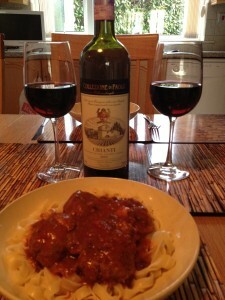 We served the meatballs with pasta and thought an Italian red would be the answer. 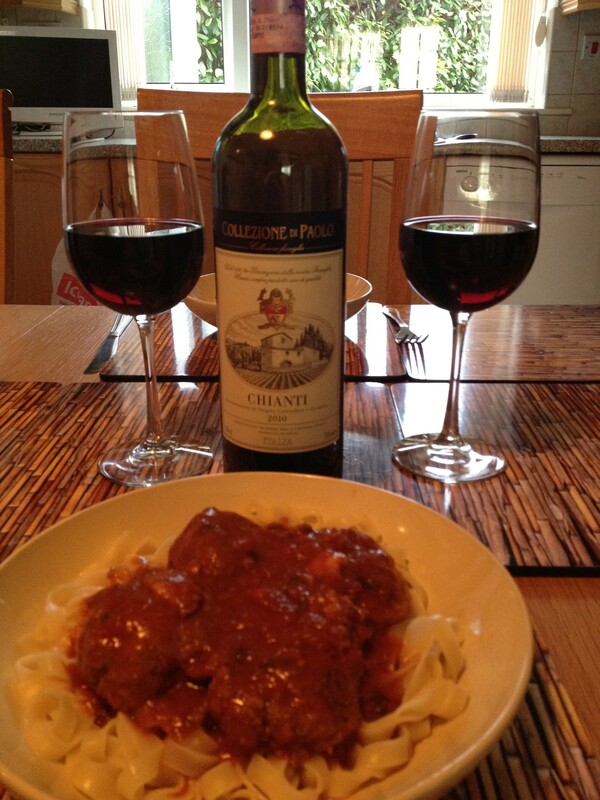 We opened a bottle of Collezione di Paolo Chianti 2010 a medium-bodied red from the Sunday Times Wine Club. This Sangiovese had smooth plum flavours, with no sharp edges, but with restrained acidity and an underlying savouriness. We thought it was a good, but not a perfect match. We tried a bottle of Copa Real 2009 with the leftovers the following day. This medium-bodied Spanish Tempranillo/Garnacha blend also from the Sunday Times Wine Club had red fruit Rioja characteristics and was a better match. 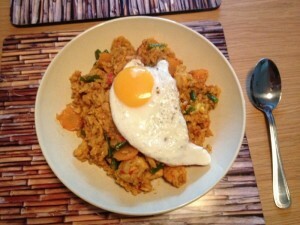 We had an Asian food weekend and we started off on Friday with Nasi Goreng (Indonesian Stir-Fried Rice) from Rick Stein. 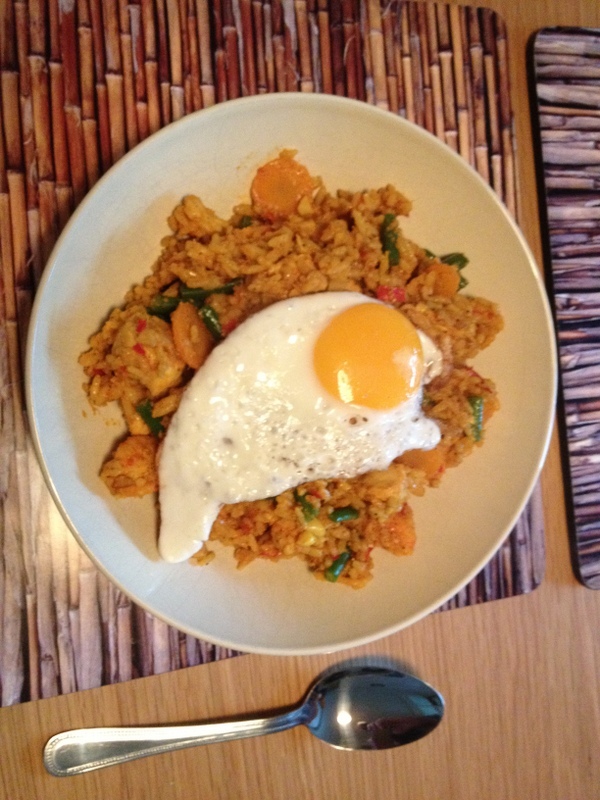 Key ingredients in the dish were chicken, prawns, chillies, Balinese spice paste and Kecap Manis. 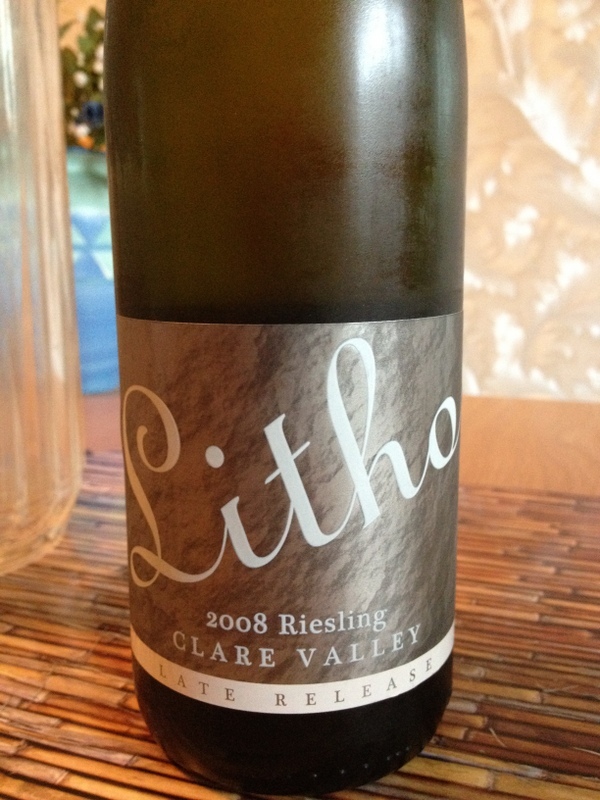 We thought this would add a sweetness to the dish, so we opened a bottle of Litho Clare Valley Riesling 2008, an Australian white from the Sunday Times Wine Club. We expected this would be off-dry like many Aussie Rieslings, but it was quite dry and its flavours were dulled by the food, so we set it aside. We then opened a bottle of Brancott Estate New Zealand Marlborough Sauvignon Blanc 2008 from Costco. We tasted fresh melon, citrus and tropical fruit flavours and considered this a better match, but still not perfect. 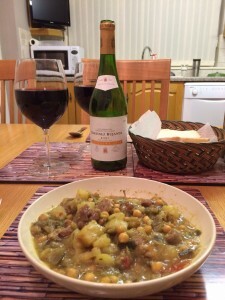 Overall the food and wine experience on Saturday was a bit of a let down, especially after the previous evening’s meal – Kerala-style Bhuna Lamb, with Chapattis from Madhur Jaffrey. 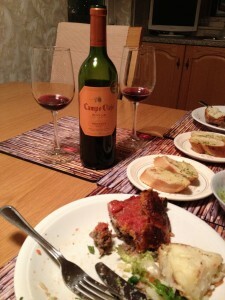 We paired it with a bottle of Marques de Carano Gran Reserva 2004 a Spanish red Tempranillo/Garnacha blend from Tesco. 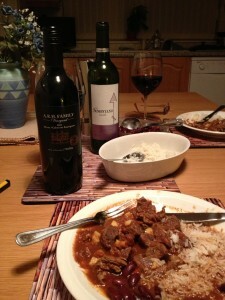 This was rich and full-bodied, with red fruits and spiciness and a good match with the richly-flavoured curry. We finished the Bhuna Lamb leftovers on the Sunday evening and again enjoyed the meal with a Spanish red, this time Conde Galiana Gran Reserva 2003 from the Sunday Times Wine Club. This medium-bodied blend was full of blackcurrant fruit,with spiciness and a smooth creamy finish from the vanilla oak. Another good match. We had some foodie friends stay for the weekend and enjoyed some good food and drink experiences with them. This evening we started with Breaded Mushrooms with a Yoghurt and Garlic Dip, followed by Beef Stroganoff from Supercook. We had an already-opened bottle of Blaxland Estate Shiraz 2011, an Australian red from Tesco. The wine’s warm spicy fruitiness coped reasonably well with the contrasting flavours of the mushrooms and dip. Not a brilliant match, but probably better than expected. 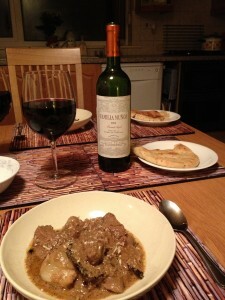 We believe Beef Stroganoff to be a challenge to pair with wine and our 25 Sept 2010 post explains why. We started with a bottle of Antano Gran Seleccion Rioja 2009, a medium-bodied Spanish red from Tesco, blended from Garnacha and Tempranillo. We all agreed it was smooth with raspberry and subtle black cherry flavours and that it went quite well with the meal. Our next wine was Bodega Monte Real Malbec/Shiraz 2011, a medium-bodied Argentinian red also from Tesco. We detected violets on the nose and smooth chocolate and black cherry flavours on the palate. We agreed it was reminiscent of Milka chocolate. It was OK with the Stroganoff, but better drunk on its own. We are still looking for a stunning match with Beef Stroganoff.